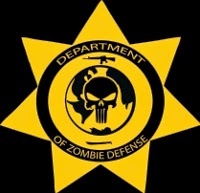 This exclusive group is devoted to the complete obliteration of the zombie infestation, and those undead who are a menace to all mankind. They make it their mission to protect every individual by eradicating every undead creature and their makers. Their instructions and guidance will aid you in being more cognizant and prepared in this every growing zombie menace. Wow, that's awesome. Those guys are definitely prepared for the apocalypse. They would more like be the only survivors if the a zombie apocalypse did occur.